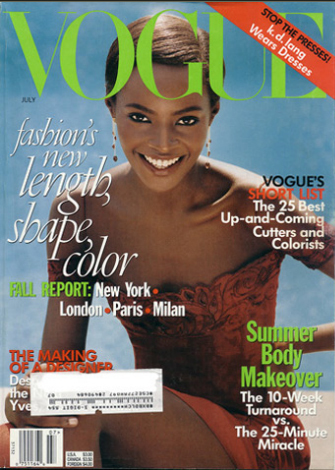 Model Kiara Kabukuru on the cover of Vogue, July 1997. Photo courtesy of Modelinia. Today’s “Throwback Thursday“ celebrates Kiara Kabukuru, the Ugandan model whose personal strength and perserverance makes her a true beauty. July of 1997, Kiara posed for this Vogue cover and made her first runway appearance. One of the most in demand models of the ’90’s, Kiara walked in shows for Ralph Lauren, Christian Dior, Versace, and Dolce & Gabbana, and was Tom Ford’s top model during his time at Gucci. At the height of it all, Kiara was about to sign a contract with CoverGirl when she was involved in a near fatal bike accident. An eighteen wheeler manned by an unlicensed driver crashed into Kiara leaving her with broken ribs, pelvis, sacrum, pubic bone and right ankle, as well as in need of major facial reconstructive surgery. After an excruciating two months in a wheelchair, and a total of ten year recovery period, Kiara successfully remerged on the fashion scene in 2008, signing a new contract with CoverGirl and being featured in the iconic all-black issue of Vogue Italia. 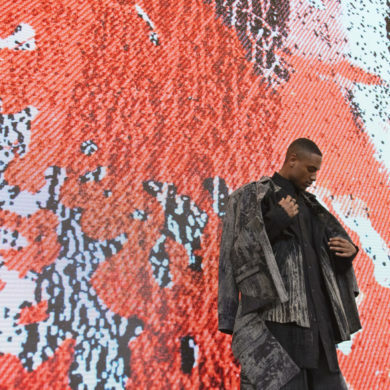 On Monday, Kiara will be covering the red carpet at the 2013 CFDA Awards for Style.com. Be sure to check out Style.com Tuesday, June 4th at 10:00 AM to catch all of Kiara’s interviews on camera. Thinking today’s post might be more of a comeback, than a throwback. What do you think?